The Residual Stress Diffractometer is used for measuring lattice strains and preferred orientation (texture), for studying residual and applied stress in engineering materials, and the effect of materials processing on preferred orientation. Designed for versatility, the heart of the instrument is a rotating drum that allows - together with three monochromators - to select wavelengths from 0.08 nm to 0.32 nm. This enables the measurement of d-spacings anywhere between 0.06 nm up to 0.22 nm at the optimal 2theta=90 deg.. The size of the sampling volumes used on a regular basis varies from 1 mm3 to 200 mm3. The double focusing Si-Monochromator has a variable curvature which allows the optimization of the measurement for intensity (texture), for resolution (peak broadening) or for Figure of Merit (strain). Beams with minimal or without higher order contamination can also be produced, either by using the Si(311) monochromator reflection which has no second order, or by using a pyrolytic graphite filter. The instrumental background is low and, depending on material, pathlength and gauge volume, peak to background ratios typically range from 1 (steel, 80 mm path, 125 mm3 gauge volume) to 300 (steel, 8 mm path, 8 mm3 gauge volume). 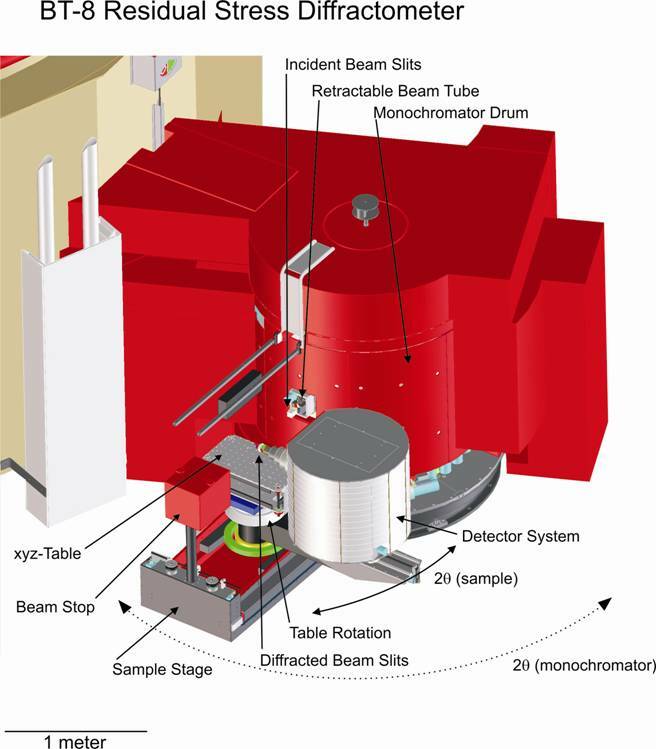 The detector is a position sensitive neutron detector with an angular opening of approx. 8 deg..